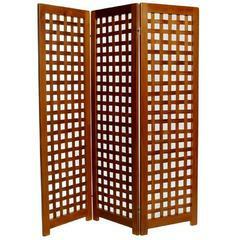 The 'V.az' is a wooden partition screen that transmits the idea of fluidity. Due to its soft openings and the idea of movement these openings transmit, it is a poetic and interactive furniture piece. It was designed on computer and inspired on triangular patterns of leaf coloring, such as those in the false shamrock and the calathea-louisae, which inspired the creation of opposing triangular openings. The v.az is made of wood strips (in the photos pinewood) cut in a CNC, and connected by four steel cables carefully distributed at different heights. Award winning piece of furniture at the "Premio Salão Design 2017"- the biggest Product Design Award in Latin America. Klassisches Faltbild aus gebogenem Sperrholz von Charles und Ray Eames für Herman Miller. Schwarze koromandel 4-fach Bildschirme im asiatischen chinesischen Stil (20. Jahrhundert) mit Szene mit Personen auf einer Seite und Blumen- und Vogeldesign auf der Rückseite.